Hi! I'm Gail--a wife to my best friend since 1970, a mother since 1973 and a grandmother 2003. Born in Colorado but raised all over the U.S., I've been an Army wife (22 years) and a missionary to Budapest, Hungary (5 years). But the title I'm most proud to have is "follower-of-Jesus" (40+ years). I started Bite Size Bible Study as a supplement to Bible Love Notes, my site that features 1-Minute devotions every weekday. 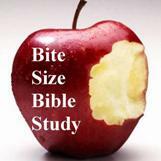 Bite Size studies are designed for busy people who don't want to "bite off more than they can chew" but still want to do a quick Bible study each week. The full text of all Scripture verses are included and there are usually no more than 3 questions. The studies are designed to do quickly in perhaps 5 minutes or less. But they also lend themselves to further study and journaling if you have the time. I have a Masters Degree from Columbia Biblical Seminary, but most of what I've learned about the Bible has been "on the job training" during my 60+ years of life. I've always loved studying the Bible, and I started writing Bible studies for my personal use over 25 years ago. I need to be challenged, encouraged, corrected and comforted by God's Word, so I study it and write what God is teaching me. I hope you'll enjoy these Bible studies. Subscribe and have them sent to your email box and/or download them,* if you'd like. I pray they will draw you into a deeper understanding of God and His Word. * You have my permission to download these studies for non-published, non-profit purposes retaining the copyright info at the bottom of each. Thanks! It's great to meet you. My husband is originally from Colorado, and he loved living there. I stopped by your other blog...and still hopping over from UBP13. I love the idea of the bite size studies. Thank you for sharing a bit about your life. I am so excited to have found you via UBP13! I have been looking for something to pick me up while at work and your blog is just the thing. Thanks for sharing. Happy I found your blog through the UBP! I am raising a daughter with special needs and sometimes feel like there is never enough time in the day! Bite Size Bible Study is such a great idea for those busy days! I share about my faith and daily life over on my blog www.cupcakesandhomeschool.com Hope you'll check it out! Gail I would love to do a Bible Study in my home on this particular topic How & What? Do you have any books or suggestions on material I could use to do this? It's nice to meet you Gail! My name is Melissa. I just wanted you to know how much I enjoy and appreciate your "1 minute Bible love notes"!! I'm a disabled wife and mother of a grown son.I'm at home every day and your "notes" is something I look forward to getting each day! Thanks so much! Sincerely, Melissa. Thank you, Melissa, for taking the time to encourage me! I'm always blessed to know that the things I write are encouraging other Christians. And I lift you in prayer as I write this - that you will continue to feel God's purpose, strength, comfort and peace in your life. God bless you. Hi Gail. Thank you for the good Bite Size Bible Study. I often use some of the info in my sermons. You have good clear thoughts with matching scriptures. Thanks so much for the encourage it brings each day. God bless you in this on going ministry that our Heavenly Father has given you. Thank you so much for your encouragement. It blesses me to know that God is using the things I do. I don't think it is a coincidence that I "stumbled" on your site this Resurrection Sunday 2017. The LORD has been steadily convicting me over the past year to repent over habitual sins. By His Holy Spirit, through Jesus I will give Him the love and obedience He deserves now once for all. Your site is another tool He has blessed me these recent days - a tool that I already know will be a blessing for many years to come. I'm blessed to hear that you are responding to the Lord's conviction and I'm glad Bite Size can help. I pray that you will grow stronger and more committed each day. Our Lord is worth our all and our everything! God bless you. I think you are referring to this devotion from my Bible Love Notes site that has links within it about yoga. Gail, I just started teaching a women's Bible study. Your Bible Love Notes and Bite Sized studies are such a valuable resource. Do I have your permission to use some of your BLNs in my classes? Also, do you have any BLNs on our old identity vs our new identity in Christ? Hi Gail! I’ve been reading your emails for several years now, and I love it! I really appreciate each one of them! I’ve been reading a book that you might appreciate called “Pagan Christianity” about the history of some of our various church traditions and their roots in paganism as the early church grew. I definitely trust God and the way the church grew is no accident, but I think it’s time to look at our roots and God’s original intent for the church. The book is startling, and I think you’ll enjoy it. Thanks, Deborah, I'll check it out. A search bar for topics is what I'm looking for. You'll find a search box in the upper left corner of the page and you can also find an list of each devotion along the top header bar listed by the year.